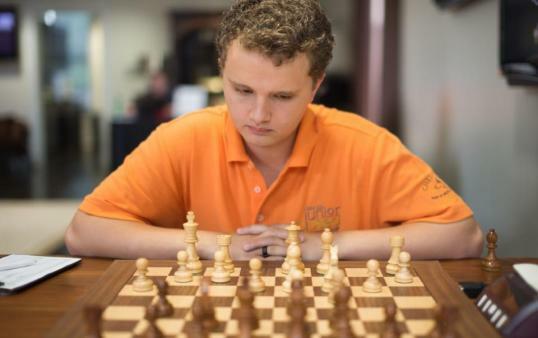 GM Kayden Troff, the 16-year-old phenom out of Utah, has won the 2014 U.S. Junior Closed Championship in clear first with an impressive 7/9 score, grabbing the national championship for players under 21 by finishing 1.5 points ahead of the field. For his efforts, Troff has won the top prize of $3,000, as well as an invitation to the 2015 U.S. Championship. In his fourth appearance in the Junior Closed, Troff entered as the tournament’s top seed and only grandmaster, ultimately tallying six wins across the 10-player, round-robin event. That is twice the amount of victories Troff has recorded in preceding Junior Championships, his previous-best score coming last year at 4.5/9. And despite the strong finish, Troff’s new title was anything but certain until the end — especially after his fifth-round loss to FM Michael Bodek knocked him down into a tie for third place entering the rest day. Troff apparently found zen on the rest day, however, returning to win out the rest of the tournament in convincing fashion. To get back to the top, Troff was forced to go right through it: Both his sixth- and seventh-round opponents, IMs Luke Harmon-Vellotti and Jeffrey Xiong, were tournament leaders at the time. And though a late surge by Bodek brought him within a half-point, Troff handled his own fate just fine by taking down FM Josh Colas and then the feisty NM Matt Larson in the final two rounds. Troff’s impressive score comes out of an extremely hard-fought Junior Closed Championship that featured 33 decisions across 45 games — and most of the draws were bitter fights to the end. “I think this tournament makes a good statement on where the U.S. is headed in chess,” Troff said. “All these good players who all play so well, I have so much respect for them. Even Matt Larson, even though he was the lowest-rated by quite a bit, showed his guns and brought it to this tournament. Winning the national crown caps off an impressive month for Troff, who just earned his new grandmaster title at the Chicago Open and continues to grow as one of America’s ambassadors of chess. The 16-year-old is a promising member of the Young Stars – Team USA program partnership with the Kasparov Chess Foundation, which provides coaching and other support, and is partly responsible for padding more than 200 points to his rating over the last two years. Days before arriving in St. Louis for the Junior Closed, Troff and the Young Stars visited Washington D.C. for the second time to help promote the educational benefits of chess to Congress. Bodek (5.5/7) finished in a tie for second with Troff’s fellow Young Star IM Sam Sevian, who scored 4.5 in his last five rounds after suffering three losses in his first four. Xiong (5/7), another Team Stars member, finished in clear fourth after the leading the tournament in its entirety, until Troff knocked him down in round 7.